A 19-year-old man will appear in court after four pedestrians were struck by a vehicle in Leicester city centre last year. Three men and a woman were hit by a car that failed to stop on Humberstone Gate on 1 November. Wahid Rob, from Neston Road in Leicester, has been charged with four counts of attempted grievous bodily harm and dangerous driving. 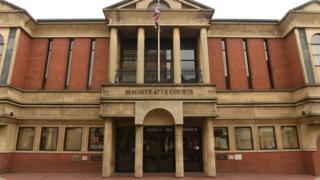 He is set to appear at Leicester Magistrates' Court on 10 July.